The south Asian tsunami of 2004 did not hit the coast of Andhra Pradesh (AP) as ferociously as it struck Tamilnadu (TN), further south in peninsular India. Loss of life was much less in AP compared to TN. But loss of livelihood was on a comparable scale. This being the scenario, it became easy for everyone - governments, NGOs, media - to ignore the tsunami problem in AP, and so they did. CeFHA benefited from the extensive survey of the coast, from Kanyakumari in the South to Srikakulam in the north, undertaken by partner organisations, for not only assessing the impact of tsunami but also the extent of intervention. So CeFHA was able to base its appeal to the funding partner organisations on a need basis and arrive at a strategic partnership for fruitful intervention. People in this area were suffering from several health and nutritional disorders due to poverty and lack of education. 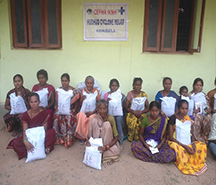 Health and nutrition education was imparted in 10 villages of 4 Mandals. Emphasis was laid on Fever, Scabies, Worm Infestation, Diarrhea, Personal Hygiene, Vitamin Deficiency and Under Five Care; Handicapped persons were surveyed in the 10 villages and were assisted with 15-tricycles, 5- Aged hand crèches. 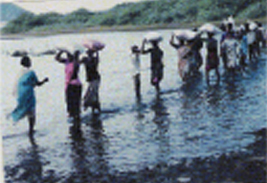 The fear of epidemics was pandemic in the tsunami affected regions. 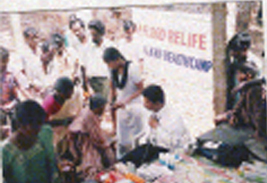 CeFHA organised inclusive health camps, addressing medical problems, vulnerabilities and disabilities. 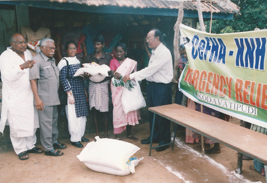 Food assistance was the immediate need which CeFHA and the partner organisations worked on. Food assistance had to be unconditional, purely humanitarian with no strings attached, yet it had to be approached in a way that it does diminish the people’s self-worth. Tsunami relief in general tended to be excessive of the kind that made communities not only numb to the past but also to the future. A majority of the funding organisations did not penetrate Andhra Pradesh and if a few did penetrate, they did not take a long-term view of the intervention. CeFHA and their partners looked at the programme strategically, identifying the areas, the communities and its constituents. Community empowerment, leadership programmes, children’s education, alternative livelihoods, social forestry and alternative energy were identified as the key components for all-round damage control and lasting rehabilitation. 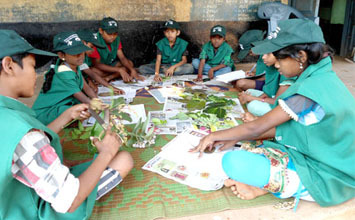 Agents of empowerment were identified from within the community and familiarised with skills and techniques through a series of workshops. Consensus building was undertaken for recognition of the role of the leadership and identification of the key issues to work on. 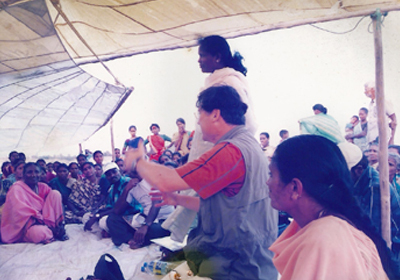 The health programmes run in the immediate aftermath of tsunami focussing primarily on trauma care, injury treatment and epidemic control were refocussed into health, nutrition and sanitation programmes with community participation. The overall goal is to alleviate the suffering of the affected widow women , poor Dalit and Tribal families and strengthening their livelihood and food-security support systems, linking the relief and rehabilitation to the development process. Looking at the situation, problems and needs in the area the project started working in the area in relief and support in livelihood to give moral support and bring a change in the life of Dalit and Tribals in the area with participatory approach. It initiated its activities along with families, meeting people in village and meeting the Community leaders, old, youth, women and children and identified issues, problems and needs. The project has already conducted a detailed study in the Community and Individual survey for the victims. During the survey the staff and people understand the damages and loss of their livelihood of the people, by which the people and staff are aware of the real situation and in the process both jointly made the assessment. 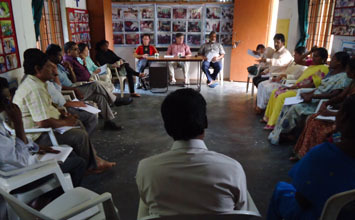 The staff discussed with children, SHGs and community, organised group discussions and shared the information. Programme Process and implementation: The Project began its work on 20th October 2014 with a base line survey and Micro-plan, started organising community meeting and sharing with community regarding the relief activity. 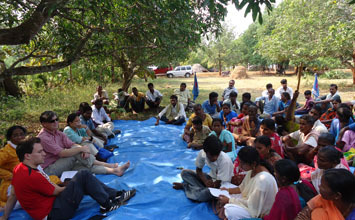 The people and children joined in the meetings, discussions, identifying the victims & loss, planning the activities. 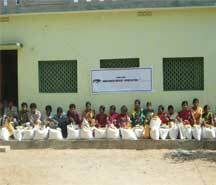 The Crisis Phase activities were initiated through Village Relief Committee in the village. 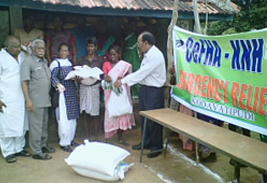 The Community was totally involved in planning and implementation of the relief. Training was imparted to selected people like members of Peoples organization, SHGs and child network in promotion of relief activities like organizing the people for food for work programme like road repair, Bore well canal cleaning, House repair, drain cleaning, sanitation, village cleaning and Drinking water well chlorination. Community participation in planning became a crucial part in this relief programme. One of the very important strategies was taken up for relief activity to initiate a process of unfolding peoples own Capabilities and skills and took immediate action to overcome from the Crisis. Among the districts which are affected by the HUDHUD cyclone, it is observed from the field survey done by CeFHA that 24 villages are affected in kotauratla Mandal in Visakhapatnam. CeFHA is planning to take up relief & Rehabilitation work in 24 villages, those who are worst hit by Cyclone, children and women are more affected and where CeFHA is already working. The targeted Beneficiaries are the 1441 Dalit and Tribal families of the 24 villages of Kotauratla and these families will be covered by KNH response. Most of these communities are depend upon a small Piece of land, agriculture labour and landless people. The affected 1441 families and 350 farmers were chosen basing on the damages occurred to the families. Lists of affected families from respective villages were collected by a team of people, along with Green Ambassadors, SHG members and dalit network members representing by CeFHA. The CeFHA strongly feels that the main emphasis of the response should be to restore the livelihood of the affected communities by the Cyclone disaster. The proposed programme includes only the neediest support to restore the livelihood of the people. 822 women were supported with a set of 3 cooking vessels with lids. The staff organised meeting in the village and surveyed the children who are listed out the children whose sleeping materials are washed away in the flood. The sleeping material kits were provided to the 897 children through the Community and Green Ambassadors children Network. The Health coordinators of CeFHA immediately moved to the village and camped for 4 days and imparted the Health Education on Sanitation and Cleaning of the houses , villages , Dead animals, drainages, canals , roads, bushes and cleaning of the Drinking water Well in the Village. They educated the villagers to boil the water and drink. They also demonstrated the ORS solution in the village for emergency cases in the village. Lot of Mosquitoes is surrounded by the villages and asks them to clean the Village. Totally 128 screened and 302 patients were treated for Diahorrea, dysentery, stomach pain, fever, Malaria, joint pain, cold & Cough; body pain and Gastric problems. The whole area was bleached with bleaching powder to avoid the diseases. In the second camp ,Totally 80 children and 96 adults were treated.128 people screened. 350 farmers were identified , whose crop was lost and the total crop was damaged due to HUD HUD cyclone , as the Rabi crop season already gone the seed will be supported in the month of April to continue the crop of Kharif in May- June . The below seeds will be supported to the 350 farmers in the month of April. 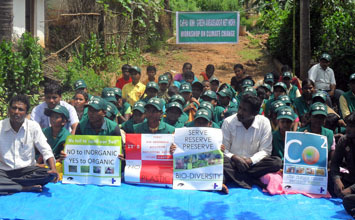 80 farmers were supported with 25 kg of vegetable seed to develop 40 acres of land. 50 farmers were supported with 125 kg of pulses seed to develop 25 acres of land. 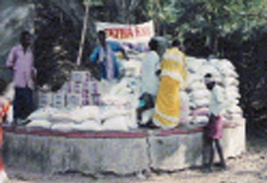 160 farmers were supported with 800 kg of millets seed to develop 80 acres of land. 60 farmers were supported with 300 kg of paddy seed to develop 24 acres of land. 577 families supported with each family 30 cashew plants, for each family for the economic support.17310 plants are planted in the area. The members of the SHGs initiated various income generation activities like Petty shops-32, Tea shops-5, Fruit business-13, Vegetable business- 7, Tailoring units-2, Goat rearing-3, Dry Fish business-1, Palm leaf crafts-2, Lime butties- 3, Rope making-2, Brooms- 2, Milk business-2 and Buffallo business- 2 in the villages and Kotauratla Mandal. Those shops/small sheds are flown/ damaged their roofs and the business materials are all lost and damaged. 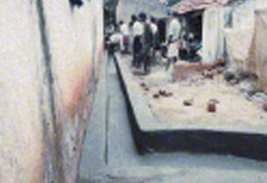 79 women and PWD from 62 groups of 24 villages are identified and lost their livelihoods. These women and PWD enterprenuers are assisted with each Rs.5000/- as livelihood support to initiate the business again to generate income for their families and self sufficient. 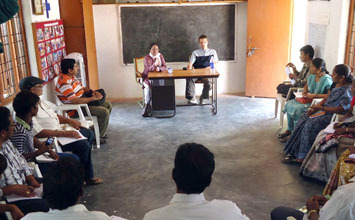 CeFHA invited a team from Visakhapatnam for a day to train the villagers on disaster preparedness and organized twice for one day workshop on Disaster Preparedness and Management at CeFHA Field Office, covering 60 persons in the work shop. 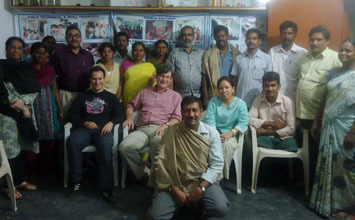 Mr. Daniel, Dr.Sujatha and Mr D’Silva attended the work shop. Disaster Prevention: The team explained the activities designed to provide permanent protection from disasters – or reduce the intensity/ frequency of a hazardous event through health assistance. 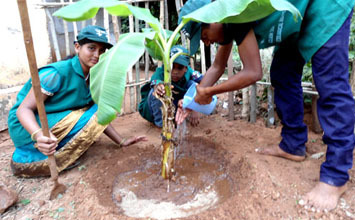 Disaster Mitigation : The team shared the measures taken in advance of a disaster aimed at reducing the impact on society and the Environment through protecting deep wells, planting trees, food for work, Community granaries and building up earth mounds on which to raise houses above a flood level. As the community is in distress and lost confidence on livelihood in the beginning, CeFHA started interacting with community, children and SHGs to build rapport and confidence by giving moral support, visiting houses and had interaction with families, children and community.Under this programme CeFHA organised various Capacity Building Trainings i.e. one day training programmes on unity, collective action and sharing under Food for Work Programme& Disaster preparedness. CeFHA also made an attempt to form the Village Relief Committees in each village and trained them for identifying the needy area under Food for Work Programme like house repairs, Canal, Drinking water well chlorination and road repairs, planning, and implementation of the proposed works. They also discussed to repair the damaged houses and Drain to prevent further flow of water through the village and divert the canal to the riverside. They are planned to work unitedly in all the works of proposed support from KNH and share the resources (Food materials) equally. During the relief period the community took a strategy to work unitedly and made joint efforts in rebuilding their respective Villages. During this period the Communities are capacitated with the Construction of the Thatched and tiled houses jointly, ordering of Agricultural implements. The People from all the villages participated in planning, implementation, documenting in the village record and monitoring.